Finally, we had our first tea of the year during Hatsugama. Spirits were high and it was a busy morning getting the Chashitsu and utensils ready for this great event. Unfortunately we had some rain which resulted in the women staying indoors and not washing their hands and rinsing their mouth at the Tsukubai as is customary before entering a Chashitsu and especially during Hatsugama. All women wore their best and most expensive Kimono's which are made of silk and other fine materials and might get stains from the rain water. Entering the Chashitsu for the first time this year, we all paid tribute to the Kakejiku (hanging scroll), Chabana (flower arrangement) and the Kama (hot water kettle). Our teacher exchanged greetings with all students one-by-one, thanking for previous year's efforts and expressing wishes for a healthy and fruitful new year. First on the agenda was the re-firing/ re-lighting of the Ro (hearth). Before any tea is to be considered, water must first be warmed to almost boiling temperatures. Everyone gathered around the Ro to see the Sumi (charcoal) being arranged by our teacher around the few already softly burning pieces of charcoal. Since most of us are beginners, we awed at the teacher's smoothness and rhythm in which the charcoal was build. Returning to our seats, we we honored to view the Kogo (incense container) one-by-one. Hatsugama is similar to a Chaji (full tea ceremony with meal) and the different parts such as Sumitemae, Kaiseki, Nakadachi, Koicha, and Usucha come in the same order. As I might have mentioned in a previous post, one of the students is a Sushi chef and always prepares wonderful food. 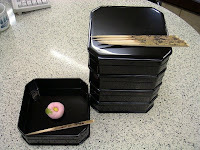 This time he prepared a beautifully decorated tray with Sushi and Kaiseki meal in boxes. Kaiseki came with sake and a relaxed atmosphere. Kaiseki meal contained boiled vegetables, fish, pickled radish and boiled rice. It was an absolute feast for our mouth and satisfaction for our tummies. Actually, students of a certain tea class have to prepare the Kaiseki meal together and divide various parts of the Kaiseki meal among each other. Or the person in charge of preparing Kaiseki should be rotated on a yearly basis. Next, we were presented with the sweets in a Fuchidaka. Every layer contains one or two pieces of sweets. Shokyaku has only one and most other layers have two pieces. The Fuchidaka is placed in front of the knees as usual, then the second layer is slid away from the body by just a few centimeters, just enough to place a Kuromoji (wooden chopstick) in the bottom box. The remaining boxes are passed on to the next guests. From here on most boxes contain two sweets, thus from below, the second layer from below is slid backwards and two Kuromoji are placed in the bottom box. Leaving the bottom box in front of the knees, the other boxes are passed to the next and the next guest who again places two Kuromoji in the bottom box etc. Most of us had never used this style and needed to be guided by the teacher. During Nakadaichi we all helped cleaning up the meal trays and prepared the room for Koicha and Usucha. It was still raining outside so we didn’t go out of the house. To balance our pallets we were pleased with high-grade Koicha. However, there was a “special” guest invited by our teacher with almost zero experience, he was seated next to me but didn’t drink much Koicha and left a lot for me. Since I was the third guest to drink and finish the Chawan, it took me some time to drink about half a bowl of Koicha which is meant to be shared by three people. Finally it was my time to get to work, a bit tipsy from the Sake but fully aware and conscious enough to pour my heart in every bowl of tea. There were in all about fifteen people who were thirsty for Matcha after having eaten their tummies full with really great food. First I brought in the Tabako Bon (box with smoking ware), then a tray of sweets. My Hanto (assistant) was and experienced older woman who liked doing that kind of job. It took me much longer than I had expected to prepare Matcha for fifteen people. I remembered some advise which I got from my wife a few months ago that I should move quicker because people are waiting for tea. I tried to speed things up but still for me it seemed to take ages. At the end my legs were completely numb so it took a couple of minutes to get enough blood flowing through my veins again to stand up and bring Mizusashi, Chawan, and Natsume back to the Mizuya. After this, our teacher prepared some presents for us, expressing her gratitude and hopes for a fruitful 2009.